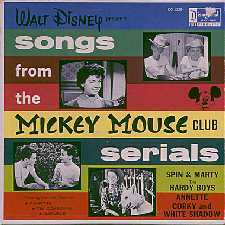 Disney label - In a picture sleeve. Disney label - Flip side:That Crazy Place In Outer Space. Canadian version of 1960 game (pictured) exists. This game was re-issued in 1960 with new cover art that no longer featured the stars of the Disney series. "Gold" plated center section has Hardy Boys on one side, 1808 Spanish dollar on the other and removes to reveal "secret" compartment containg a "treasure" map. Includes small figures of the band. Models in complete original packaging command a stiff premium. 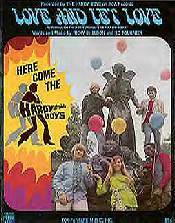 2: Set of small black & white photos of each band member & the Hardy Boys band logo. 3: Set of stamps (pictured below). Five of each band member. The pictures are the same as the small photos. 4: 4 page newsletter that has a lot of photos of the band & some bio info about each band member. It also contains a page of shameless huckstering for the show & records. 5: 45rpm record in which the band members talk about themselves and encourage the listener to promote the band.Special thanks to Rick Kelsey for the information, scans & copies he provided. 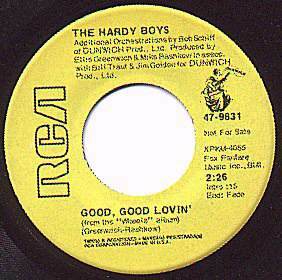 This was also released on cassette, 4-track reel-to-reel tape and 8-Track tape and is very scarce in those formats. Producers: Bill Traut & Jim Golden for Dunwich Productions Ltd. 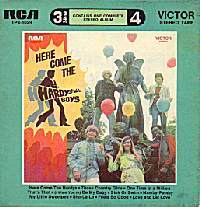 Note: Be My Baby should not be confused with the Ronettes' hit of the same name nor should Sha-La-La be confused with the Mannfred Mann ditty! Note: Sha-La-La is slightly different & shorter than the album version. 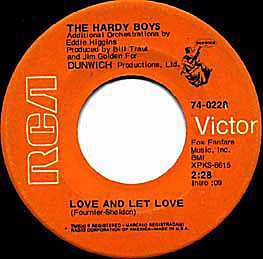 Promotional 45 RPM records were also issued. The promo records are slightly easier to locate than the actual production copies but all are tough to find. Contains: Envelope, 3 reels, 16 page story booklet & View-Master catalog. A special 1 reel "Preview" reel also exists. Manufactured by Collegeville Flag & Mfg. Co. Known costumes: Frank, Joe, Wanda Kay. Animation cels from this series have been seen on the market. 16MM films of several episodes are known to exist. ABC also licensed Topps Gum to produce "trading stamps". 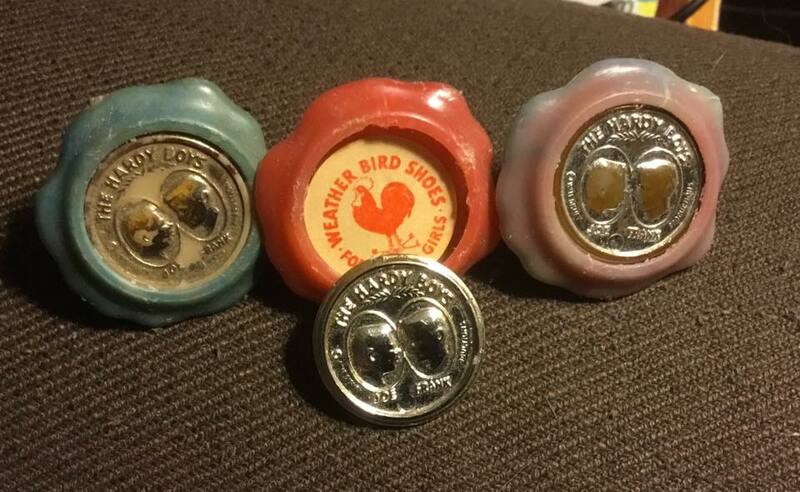 I've never seen any examples of these and don't know if they were ever produced. Metal box with plastic thermos. Manufactured by King Seely Thermos Co.
Next to the "Thunder Mountain Game", probably the most common collectible from the show and, along with the Frank & Joe dolls, the most popular with collectors. Very difficult to locate with original packaging. There are 2 styles of boxes: plain and one with "VF" printed all over it. At least 2 different photos used on front. Extremely difficult to locate in the original box. There were also large matted proof photos of the cover distributed to the regional offices of TV Guide and a few have made it into the hands of collectors. These photos are extremely rare as there were probably only a dozen or so to begin with. There is also a Canadian TV Guide with a different cover photo. 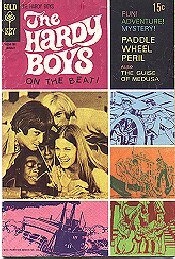 Additionally, many locally produced TV directories of the period featured articles and/or covers on the Boys. Manufactured by Sun Unlimited Inc. In addition, I've seen many home-made buttons. 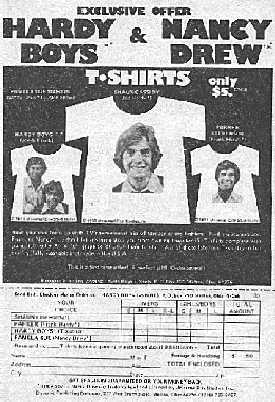 Kits also came with several advertising flyers for Hardy Boys shirts & posters and other non-Hardy related items. If you joined the Nancy Drew Fan Club at the same time, you received a Door Banner! Finding copies in their original packaging is extremely difficult. The ukelele is much rarer than the guitar. 1 each of Frank & Joe. Not that hard to find but extreme popularity with collectors keeps the price up. Dolls without box are worth far less. Gold-tone charm bracelet, necklace, ring & stickpin. Items were sold separately or in sets. 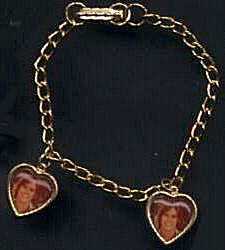 Some items have also been seen with heart-shaped rather than oval-shaped charms. The stick pin is the hardest to locate, the ring the easiest. 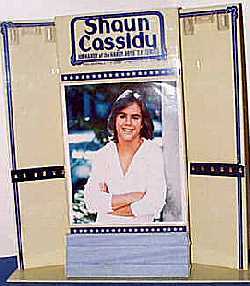 There is also a display stand made for in-store use. Both Frank and Joe versions were made. Comes in a box or on a cardboard hanger. Jeans, Pullover Shirts (long & short sleeve), Satin Jacket. Available only in children's sizes. Jeans seen in blue and tan. Jacket is light blue. Shirts seen in peach, blue, white. Most have Shaun's picture with illustration of either surfer or guitar player although a shirt with both Shaun & Parker has been seen. Finding a viewer is difficult. American & Canadian versions exist. The American version is by far the most common collectible from the show, it's EVERYWHERE! The Canadian version is much harder to locate. Many different seen, usually of Cassidy. Many of the photographs used in these posters were shot by Tony Costa. 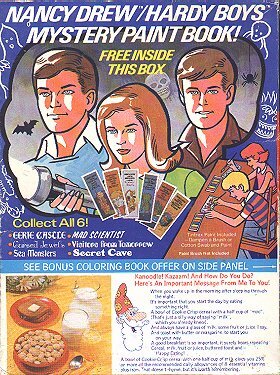 Comes with magic markers, coloring poster and full color poster of Shaun & Parker. Armada (UK) issued a 3 in 1 volume containing these two and the Dracula story. 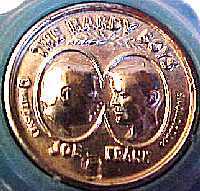 The specially marked box is nearly impossible to find and may be the rarest of all Hardy collectibles. Highly sought after due to the Nancy Drew cross-over. Parker Stevenson - The Other Hardy Boy article. Parker must have had his press agent working overtime to combat the flood of Cassidy promotions. That's OK though, he wound up getting married to Kirstie Alley but, sadly, they divorced in 1997. Contains 2 stories: The Disco Conspiracy & The Mystery Of The Missing Iceman. This album is so incredibly, laughably bad and amateurish that it has to be heard to be believed! Was there a script? Did the actors ever see it? Is this a rehearsal? Are they sober? Who knows? Your guess is as good as mine! Mercifully, none of these people have been heard of again. Although the cover has picture of Cassidy & Stevenson, they wisely chose to forego performing here. Manufactured by American Publishing Company. A couple of others feature Shaun only. Normally these players have seen rough use and pristine condition players are quite rare. Finding these with the original boxes is extremely difficult. Published in Great Britain in the late 70's and early 80's. Appears to be a modern repackaging of old stickers. Teen magazines (Dynamite, Tiger Beat etc. 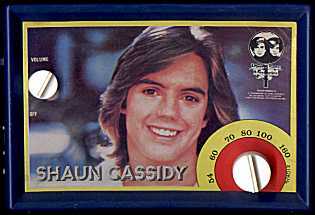 ), kid's magazines (Jack & Jill), local newspaper Sunday supplements and TV directories of the era have countless articles, usually about teen heart-throb Cassidy. 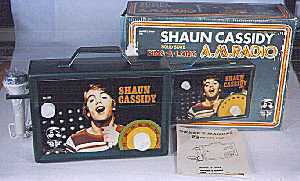 Shaun also recorded a couple of record albums (also released on 8-Track). 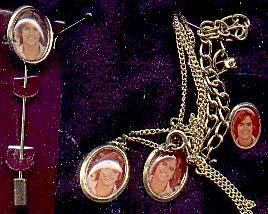 Some collectibles listed focus on Mr. Cassidy and mention the Hardy Boys in passing, if at all. Ace amateur detectives Frank and Joe Hardy find themselves embroiled in a dangerous and perplexing caper that turns the tranquil town of Bayport upside down! This time, suspicious circumstances surround an eerie mansion on the edge of Barmet Bay, the setting for an international smuggling operation. Frank and Joe's father is placed in jeopardy as the smugglers execute their devious schemes. 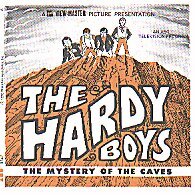 Will the Hardy Boys reach their dad in time?! This first-ever stage adaptation of the classic detective series was a box-office blockbuster during SCT's 1993-94 season. The boys are back! Following the huge success of The Mystery of the Haunted House, SCT commissioned a new Frank and Joe mystery. 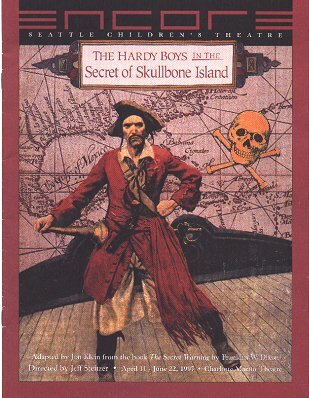 Eerie Skullbone Island is rumored to be haunted by the ghost of Redbeard, a notorious pirate whose ship was sunk in a fierce battle. Frank and Joe hardly believe in ghosts, but when a ship sinks in Barmet Bay with a solid gold Pharaoh's head in its cargo, Redbeard suddenly reappears, wreaking havoc on the sleepy town of Bayport. The plot thickens when a mysterious art dealer enters the picture, and Frank and Joe, with their crime-solving friend Callie Shaw, are hot on the trail of another whodunit! 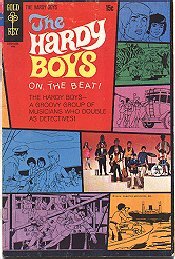 A musical parody of the Hardy Boys mystery stories. Presented by Stage Left Theatre Projects. X-Rated parody, not for the kiddies. 1976 - The Ghost Of The Hardy Boys - The autobiography of Leslie McFarlane, ghostwriter of the first 20 or so Hardy Boys stories. Published by Methuen/Two Continents. Nice article about the Boys. 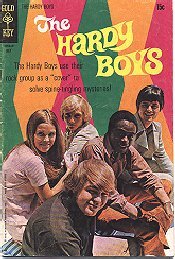 Reissued with slight modifications in 1978 as The Hardy Boys And Nancy Drew. This story was reprinted (without the color illustrations) in the first volume of the Super Sleuths series. A 2 cassette set narrated by Cam Clarke of the King Family. Not a bad version but some of Mr. Clarke's voice characterizations (particulary Biff's, which sounds like a cross between Leo Gorcey & Jerry Lewis) are hysterically bad. The cover has a copyright of 1985 but Mr. Clarke announces a 1983 copyright on the first tape and the tapes carry a 1983 copyright. This is still available from Amazon.com. 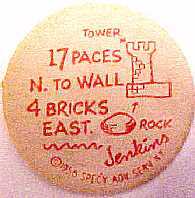 1985 - National Lampoon - July - The Undiscovered Notebooks Of Franklin W. Dixon parody. 1987 - Simon & Schuster gave away a 64 page sampler of chapters from the first four Casefiles. Some in-depth interviews with the show's stars and an article. 1997 - A couple of paperback books about Hardy Boys ghostwriter, Leslie McFarlane. 2002 - Hardy Boys Guide To Life, a mini-book of aphorisms collected from various Hardy Boys stories. 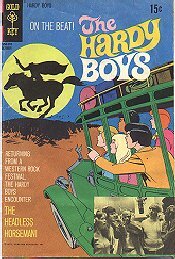 2007 - Mini-edition of The Hardy Boys Guide To Life published by Running Press Books. Current: Hobby Builders Supplies produces a miniature copy of the Applewood reprint of The Secret Of The Old Mill. This one inch high wonder has a complete DJ with flaps and the 1927 text. Very well done. Current: Well-heeled collectors can purchase original cover art from the newer Hardy books from various dealers. While very attractive, these items tend to be extremely pricey. You, as Nancy Drew, tag along with detective pals, Frank and Joe Hardy, on a mysterious train adventure that starts in Chicago and heads west. The train ride is hosted by Lori Girard, a prominent and beautiful socialite, who has gathered a group of top detectives to help her unravel a century-old secret. You, as Nancy Drew, go to Hawaii to serve as a research assistant to Dr. Quigley Kim. A devastating scourge is destroying the pineapple crop causing residents to whisper that a local research compound has awoken the legendary Kone 'Okala. Upon arriving, she discovers the camp ravaged with Dr. Kim missing. 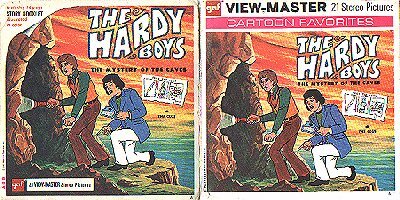 Coincidentally, the Hardy Boys are also on the Island to complete top secret mission, but it's up to Nancy to uncover this intricate web of mysteries. 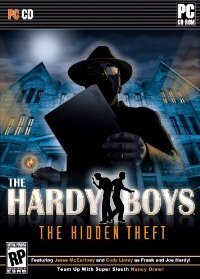 The vault of the Spencer Mansion is robbed, and the Bayport Police call on the Hardy Boys to help tie up some loose ends, but they soon find themselves in the middle of a major criminal investigation that takes them on an adventure all over Bayport, and even into New York City. But the pieces don't add up, and Frank and Joe find themselves embroiled in a drama of sinister proportions. Is the recent theft linked to something from the past? Can Frank and Joe find and decipher the clues in time to prevent another crime from happening? Features the voice and likeness of Hollywood teen stars Jesse McCartney and Cody Linley as Frank and Joe Hardy. Play as Two of History's Most Famous Literary Detectives and interact with Fenton and Laura Hardy, the Hardy Boys' friend Chet Morton and others. Experience the Hardy World on your PC - the literary world of the Hardy's is brought to life! Check out the Hardy Home, Bayport Police Station and the various places most have only experienced through the pages of a book. Cell Phone Feature - use your cell phone to give pal Nancy Drew and other characters a call and get insight on the case. Search For Clues - super-sleuth your way to solving the small mysteries along the way as you help Bayport Police catch the culprit. Mystery Solving Mini-Games - each mini-game solved throughout the investigation gives players valuable pieces of evidence to help solve the case. Choose Your Dialogue - choose from a variety of responses to make your Hardy Boy's experience your own!